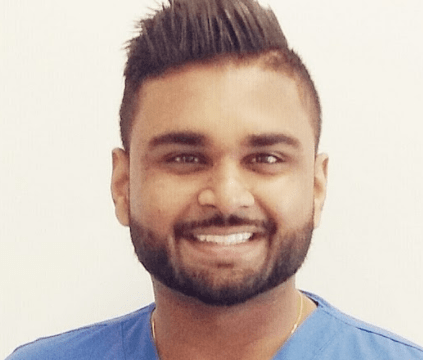 Sanjaya grew up in Auckland and upon completion of high school, left to South Australia to commence a career in Dentistry. Graduating from the University of Adelaide with Bachelor of Dental Surgery and Bachelor of Science in Dentistry [Honours] in the field of Oral and Maxillofacial Surgery, Sanjaya initially worked for the Royal Flying Doctor Service based in Broken Hill, Australia. After which he moved back home to Auckland where he has gained experience in both private practice and Accident and Emergency dentistry. He has also completed a Bachelor of Medicine; Bachelor of Surgery, which allows him to incorporate his knowledge of general health and the impact this may be having on your oral health. Sanjaya is a highly motivated and hardworking clinician whose experiences in a number of clinical settings have allowed him to gain a keen interest in all aspects of general dentistry, including special interests in oral surgery (surgical extractions and wisdom teeth extractions) and prosthodontics (crown and bridge including full mouth rehabilitation). Sanjaya is a sound communicator of treatment plans and aims to provide a full range of dental services tailored to each individual patient in a comfortable setting.